TSMS/ Telangana Model School 6th Class Admission Entrance Test 2018 Notification released on 21-01-2019. రాష్ట్రవ్యాప్తంగా ఉన్న 192 మోడల్‌ స్కూళ్లలో 6వ తరగతిలో ప్రవేశాలకు ఈ నోటిఫికేషన్‌ను జారీ చేసేందుకు ఏర్పాట్లు చేసింది. 7, 8, 9, 10 తరగతుల్లో మిగిలిపోయిన సీట్లను కూడా ప్రవేశ పరీక్ష ద్వారా భర్తీ చేసేందుకు చర్యలు చేపట్టింది. 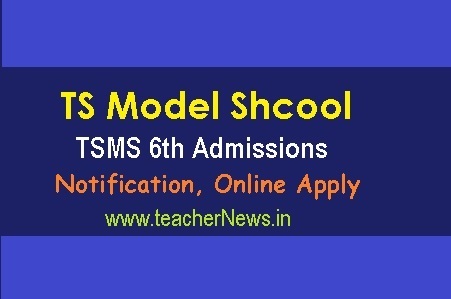 TS Model School (TSMS) 6th Class Admission Entrance Test 2019 Notification, Online Apply last Date. TSMS 6th Class Admission Test 2019 Schedule, Exam Fee, Online Application, Exam Pattern, Syllabus Download for TSMS CET 2019. TS students who wish to take admissions in the Telangana Model Schools. Telangana government conduct admissions in 6th class in model schools. Online payment before procedure, Fee Payment procedure, Important Dates ,Uploading photo and Online Application Submission procedure. Telangana State and each model school has 100 seats divided into two sections. The medium of instructions in model schools totally in English. RC.no.550/B1/MS/TS/2013-15 School education - Telangana state model schools admission to class VI for the academic year 2019-20 in 182 model schools - issuing notifications and guidelines . Tags: TS model schools admission test 2019, TSMS Notification 2019, Model 6th/ VI class entrance test 2019, tsmscet online apply, TSMS CET 2019 Exam Pattern, TS Model School Schedule, Telangana Model School Entrance test Syllabus, TS Model Schools 6th Class Entrance Test 2019 hall tickets,results notification, TSMS Results 2019, ts model school results 2019, Telangana model school result 2019-2020, TS model school 6th class entrance test notification 2019 Results.ts model school notification 2019, TS model school admissions 2019, telanganams.cgg.gov.in 2019, Ts model school entrance exam model papers for 6th class, telangana model school notification 2019-20, Telangana model school notification 2019, ts model school admissions 2019, ts model school syllabus. TS Model School Admission Online Apply 2019 TS Model Schools Online Entrance Exam 2019. TSMS 6th, 7th, 8th, 9th,10th classes Entrance test Online Apply Application Form @ telanganatm.cgg.gov.in.